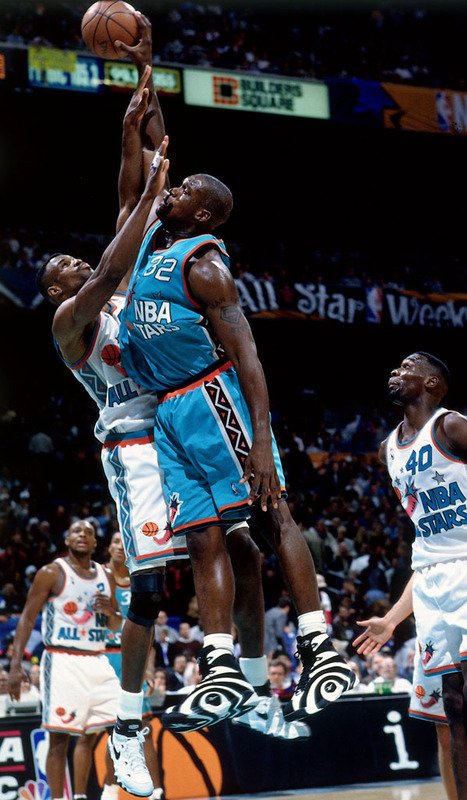 When singling out my favorite moment in NBA All-Star history, Shaq's posterization of David Robinson in the 1996 All-Star Game is an absolute no-brainer. The dunk itself is a monster, but context puts it over the top. Shaq and Robinson had a rocky relationship, apparently stemming back to an incident in which Robinson snubbed a younger Shaq on an autograph during his time at Texas' Cole High. The two would exchange barbs through media and print for years, even after their '96 run-in. Now, add that to the fact that the '96 game was played in Robinson's home arena, the Alamodome in San Antonio. Michael Jordan was back in the All-Star lineup. Penny Hardaway and Grant Hill were in their primes. The uniforms were over the top. One couldn't ask for a better setting. As time wound down in the fourth quarter, Shaq ran a break with Hill, who found him on the top of the key at the other end. Shaq took one dribble and powered through a one-handed tomahawk dunk over a contesting Robinson. 'Oohs' and 'Ahhs' were heard from the crowd as Shaq saluted teammate and fellow Omega Psi Phi member Michael Jordan with Que Dog hooks. Shaq helped lead the East to a 129-118 victory with 25 points and 10 rebounds. To make things better, all of this happened while Shaq was wearing his most well-known signature shoe — the Reebok Shaqnosis. The '96 game may have featured the best collection of sneakers we've ever seen on the court at once, and the Shaqnosis was definitely an attention grabber. 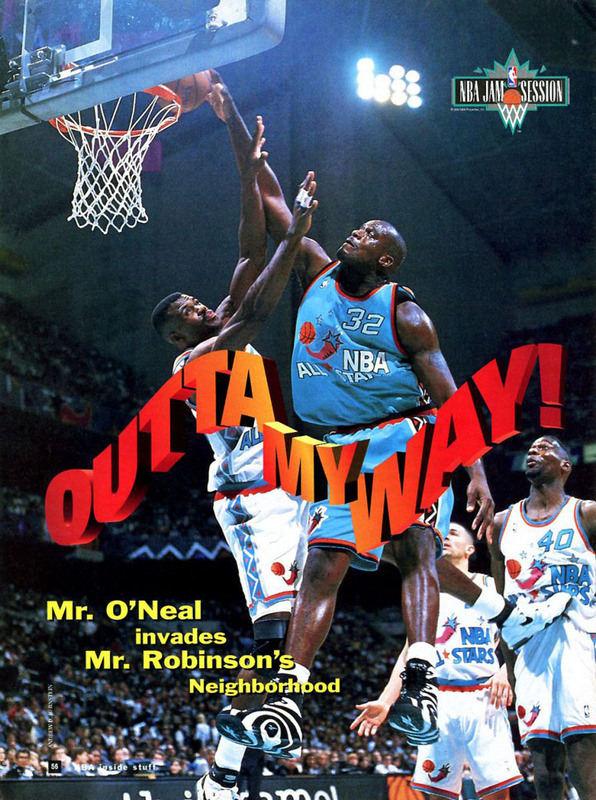 It wasn't the first time Shaq posterized Robinson, and it wouldn't be the last. 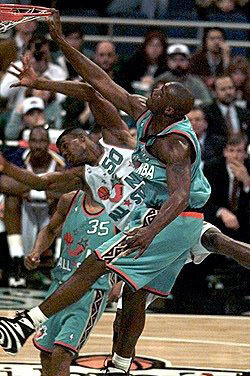 However, if you were to make a list of the ten most memorable plays from Shaq's career, this dunk has to make the cut. Shaq was never the type of player to shy away from the moment, and the '96 All-Star Game was one of the earliest indications that we were watching a next-level player. For Shaq's 42nd birthday, we're revisiting this classic moment with a video and a few photos. Check out the clip above and let us know where it ranks on your list of all-time posterizations.